Size: Tall - for individuals 5'7" to 6'10"
With the technological and ergonomic advances of the past years, items such as bicycles chairs, computers, and cell phones have now been designed to work with the user. Gone are the days of the user having to adapt to the product. As many items have evolved ergonomically, one item has not. The crutch, though essential to rehabilitation and recovery, has not had a significant design change within the past 70 years. Modern medicine demands an ergonomically designed, comfortable crutch that helps the patient maintain proper posture, relieves damaging stress, and reduces the overall chance of injury. Conventional crutches are not ergonomically designed, and their users run the risk of serious injury. This unique feature provides for better sense of stability in use. The cradle feature allows for greater position confidence while in the walking motion. As the walking movement proceeds, the front position of the under arm cradle gives the user forward arm and shoulder support. Consequently, there is less reliance on the direct underarm pressure. Since the user relies less on the underarm support, there is a reduction in back and shoulder stress. Larger area enhances sense of walking stability. Reduces underarm fatigue and soreness. More comfortable and easy to use. The ergonomic grip on our shock-absorbing crutch is at an angle (12 degrees) designed to provide the greatest amount of blood flow and reduced trauma to the nervous system. Designed for repetitive and vigorous use. Allows proper blood flow and nerve conduction. Reduces carpal tunnel syndrome and wrist tendinitis. Traditional crutches are awkward to use in crowded settings such as in a car, or on an airplane, sitting in an audience, or at a restaurant. The collapsible feature of our crutch makes using it in public places much more convenient. It simply folds for easy storage. Convenient to fold and store. Easy to carry, package and ship. 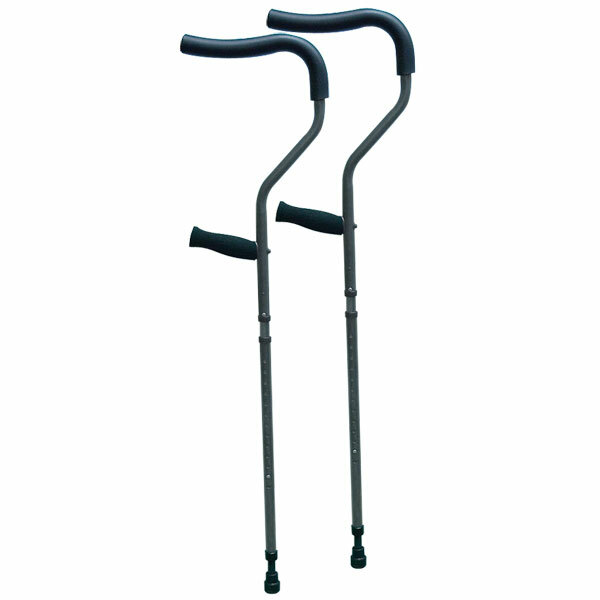 The shock-absorbing feature of the crutch increases comfort by reducing stress, fatigue and soreness. The tension of the shock absorber allows the necessary cushion in each step, but is firm enough to provide a feeling of security and stability. Increases comfort by reducing stress, fatigue and soreness. Reduces pain in back, shoulders, elbows, arms and wrists. Maximum user weight is 500 lbs. Size: Tall - for individuals 5'7" to 6'10". Fully adjustable length can be set to a minimum of 4' 2 to a maximum of 5' 1-1/2 to fit almost anyone. --Rubberized armpads measure 1 foot in length and the foam-padded hand-rests measure 6 inches in length.